I’m feeling all kinds of trendy today with these tuna poke bowls. Bon Appétit magazine featured a poke bowl on their cover this month and turmeric seems to be the “it” spice at the moment. The humorous part though is that I am so not a trendy person (just ask my kids). Fortunately, food that is fresh, delicious, and satisfying without feeling heavy never goes out of style and these tuna poke bowls hit the mark on all counts. Originating in Hawaii, poke (pronounced poh-kay) is cubes of raw fish, usually ahi tuna or salmon, tossed with any number of mix-ins from dried seaweed to sweet onions and lightly dressed with a soy sauce based sauce. It has actually been around for awhile but has only become more mainstream in the last year (as usual, I’m late to catch the trend). Combinations for poke are endlessly creative. This particular combination of ahi tuna, seaweed salad, avocados, fish roe, and turmeric rice was inspired by a poke bowl I had in Los Angeles. The turmeric rice was a new addition I hadn’t had before and made the poke bowl feel more like a meal and not just a snack. 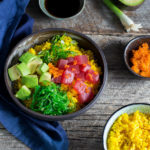 I have been wanting to share a recipe for poke bowls for awhile now but being able to recommend a good source for raw tuna stopped me each time I thought about it. I finally decided that the sushi counter that is available at most good grocery stores these days was where I could consistently get good raw tuna. I buy a package of the tuna sashimi and, while I’m there, I also pick up a package of the seaweed salad. Just like for my Chimichurri Steak and Quinoa Bowls recipe, I have no shame in saying that I shop at the salad bar (or, in this case, the sushi counter) to keep things easy. Except for the turmeric rice, the quantities listed in the recipe below are really flexible. Feel free to use more or less of an ingredient to suit your tastes. Now full disclosure here – the raw tuna was not a hit with my kids. They liked everything else in the bowl but raw fish was too much. However, the adults I served this to loved this combination. Next time, I think I might follow Bon Appétit’s suggestion of using poached shrimp for those who don’t like raw fish. Or I might just have to come up with a whole new poke bowl … oh, the possibilities! In a medium saucepan with a tight-fitting lid, heat the butter and the olive oil over medium heat until the butter is melted. Add onions and garlic and cook until the onions begin to soften, stirring occasionally. Add rice and turmeric; stir until the rice is evenly coated with the turmeric. Stir in chicken broth, bay leaf, thyme, salt and pepper. Bring mixture to a boil, then reduce heat until mixture is at a low simmer. Cook until rice is al dente and the broth is absorbed, about 15 minutes. Stir the rice occasionally to prevent it from sticking. Uncover rice and let sit for 5 minutes to let the remaining liquid absorb into the rice. Fluff the rice with a fork. Discard bay leaf. Let the rice cool while preparing the remaining ingredients. Cut the tuna into 1/2-inch cubes. Set aside. Thinly slice the scallions at a slight angle. Set aside. Peel, seed, and cut and the avocados into small chunks. Divide the rice among 2-3 bowls. Top with the desired amount of tuna, seaweed salad, scallions, avocados, and fish roe. Drizzle with ponzu sauce. If you can’t find high quality fresh tuna at the fish counter that you feel good about eating raw, buy tuna sashimi at the sushi counter in your grocery store. Ponzu sauce is a citrus-based sauce often used in Japanese cooking. You can find it at most grocery stores on the same aisle where the soy sauce is found. Recipe for rice adapted from the NY Times.